I never tire of watching wild parrots. Since I don’t exactly get tired of observing any birds, perhaps what I really mean to say is that an inescapable twinge of excitement accompanies every screech and sighting that can be attributed to any of Costa Ricas 17 Psittacid species. Whether it’s the daily flyovers of Crimson-fronted Parakeets that screech from the skies above my house in the Central Valley, Scarlet Macaws that grumble from the canopy of the tall forests in Carara, or elusive Barred Parakeets that remind me of crossbills as they chirp and zip over the ridges of the high Talamancas, there’s always something special about seeing a wild Psittacid. I think “wild” might be the key word here because the parrots or macaws we saw in Niagara Falls, New York were either in the pet store or featured in television commercials. They just couldn’t be real, wild birds no matter what those bird books said because that would be just too cool to be fact. Therefore, every time I see a parrot, parakeet, or macaw in Costa Rica, I feel a flurry of excitement and recurring revelation that vanquishes my childhood doubts about the existence of such amazing birds. Macaws, genus Ara– two species, easy to identify. Scarlet Macaw: Bold, brilliant, and loud, its pretty hard to miss this species. In Costa Rica, they used to range the length of both slopes but habitat destruction and persecution have nearly eliminated them from the Caribbean slope and reduced them on the Pacific slope to two, well-known populations, one at Carara and a larger number of birds on the Osa Peninsula. There is also a small population around the dry forests of Palo Verde and Curu, and they have been making a slow comeback on the Caribbean slope. Scarlet Macaws are always spectacular. Great Green Macaw: This flagship species of Costa Rican conservation is kind of like the “sea turtle of the rain forest” in terms of its status and buzz about its plight. Like sea turtles, this bird is in serious trouble and needs as much help as it can to avoid going extinct in Costa Rica. The main threat to its future existence in Costa Rica is destruction of lowland rainforests and cutting of a tree that it very much depends upon, Dipteryx panamensis or “Almendro”. 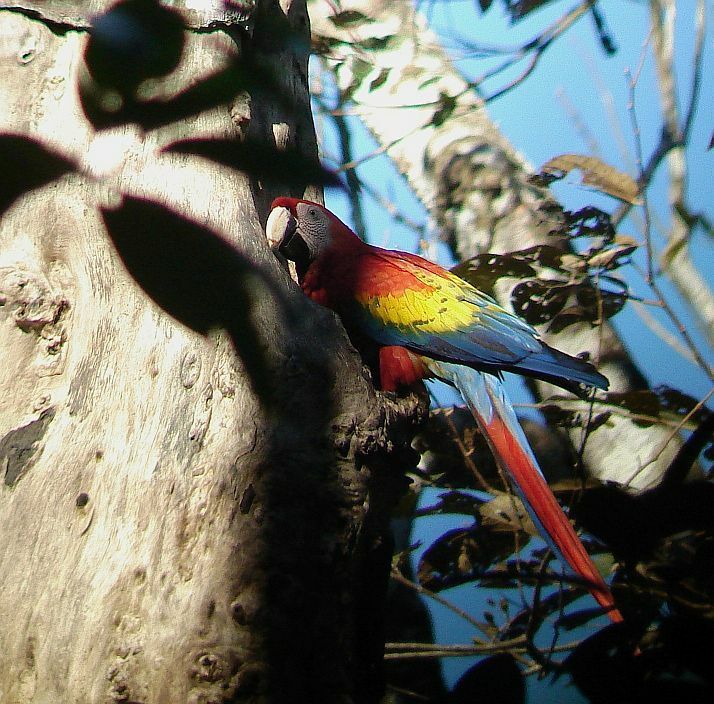 Like Scarlet and Red and Green Macaws in southeastern Peru, the Great Green relies upen big, old growth Dipteryx species trees for nesting and as a food source. Unlike, macaws in Peru, however, Great Green Macaws in Costa Rica have not used nest boxes with very much success. This awesome bird can still be seen in the Sarapiqui area and is more common in Tortuguero and near the Nicaraguan border but I doubt that I will see it again at Quebrada Gonzalez (I used to see flocks there during the wet season). 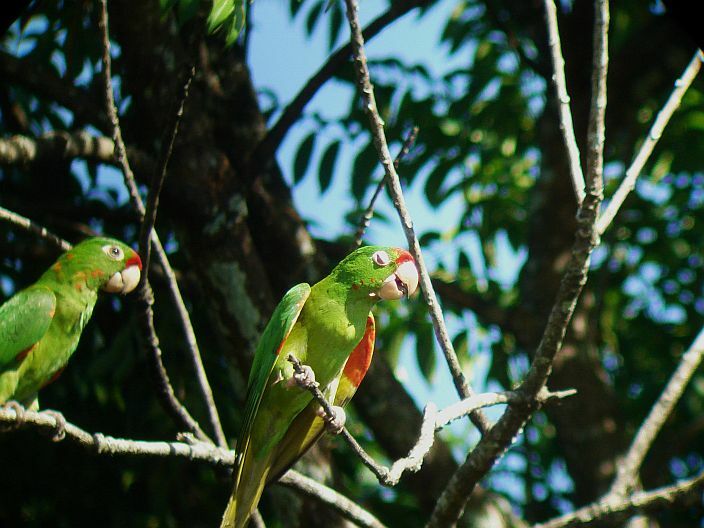 Amazona genus parrots- four species, watch for their distinctive, shallow wing beats and learn the calls! Mealy Parrot: This large parrot is commonly seen in forested sites of the humid lowlands (although I get the impression that its numbers have decreased since I first came to Costa Rica). When perched, they are easy enough to identify but hard to see as they quietly forage in the canopy. Like most parrots, you are more likely to see them in flight. They are easily confused with Red-lored Parrots throughout their range and with Yellow-naped Parrots on the Pacific slope in the Carara area. Watch for the green front and pay attention to their harsh calls. 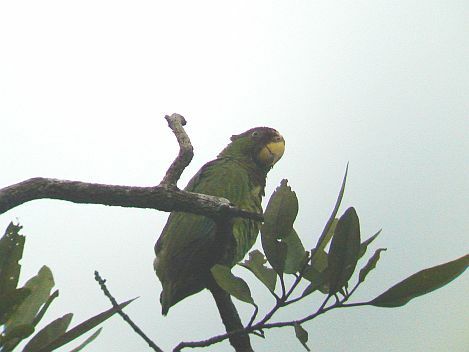 A Mealy Parrot attempting to hide behind a branch. Red-lored Parrot: Another good sized parrot, this edge species is pretty common in the lowlands and is the only Amazona species parrot in Costa Rica with a red front. Its calls can sound similar to those of the Mealy Parrot but have a more ringing quality to them, like “clink clink” rather than the harsh squawking of the Mealy. Yellow-naped Parrot: About the same size as the Red-lored, trapping and habitat destruction have reduced its population although it is still regularly seen in a number of areas including Cerro Lodge, Santa Rosa and Guanacaste National Parks, and Palo Verde. As the yellow nape can be hard to see in flight, pay attention to its distinctive calls that have a human-like or “laughing” quality to them. White-fronted Parrot: The smallest of the Amazona genus parrots in Costa Rica, is still flies with shallow wing beats but is more frequently seen in flocks than the other Amazona species and is fairly common in dry forest. Its yellow bill, white front, and red patch on the forewing also separate it from Mealy, Red-lored, and Yellow-naped Parrots. Listen for its more rapid, staccato-like vocalizations. A not so great shot of a psycho-looking White-fronted Parrot. Pionus genus parrots- two species, watch for their distinctive, deep wingbeats. White-crowned Parrot: This edge species is one of the more common parrot species in Costa Rica and can be seen from the lowlands to middle elevations (including green spaces in the Central Valley). The white crown and bill can often be seen in flight. Also listen for their screeching, “trebled” call. A White-crowned Parrot hanging out in the canopy at El Gavilan lodge, Sarapiqui region. Blue-headed Parrot: An edge species that replaces the White-crowned further south, the Blue-headed Parrot is mostly seen in the Golfo Dulce and southeastern lowlands of Costa Rica although it can show up at least as far north as Sarapiqui. They fly with the same deep wingbeats as the White-crowned but have a darker head and bill and more abrupt vocalizations. Pionopsitta genus parrots- one species, “a parrot that sounds like a parakeet” and has wingbeats in between those of an Amazona and Pionus. Brown-hooded Parrot: A bird of rainforests, this species is most common in heavily forested, humid zones although it is also sometimes seen in flight over the central valley or other deforested areas (how I got it on my yard list). Watch for the red on the underwings, look for the brownish head, and listen for the rather musical, parakeet-like calls. That’s probably a bad description of their vocalizations, but is what comes to mind! 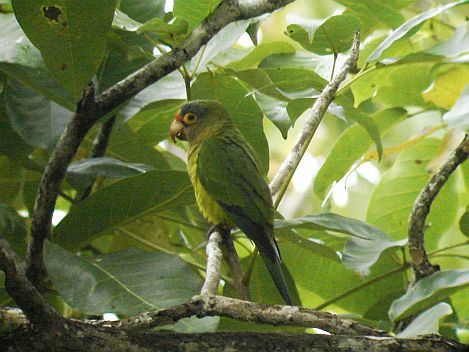 Pyrrhura genus- one species, a long-tailed parakeet of the Talamancas. Sulphur-winged Parakeet: Like most members of this primarily South American genus, it has a small range and is the only parrot species restricted to the highlands of Costa Rica and Panama. It’s pretty common in the cloud forests of the Talamancas and is usually located by its high-pitched, reedy calls. It is the only long-tailed parakeet likely to be seen in its range although sometimes can overlap with Crimson-fronted Parakeets when they move to lower elevations. Sulphur-winged Parakeet from the Dota Valley. Aratinga genus- four species, rather common, long-tailed parakeets. Crimson-fronted Parakeet: One of the most common and easily seen Psittacids in Costa Rica, it has fortunately become adapted to nesting on buildings in the central valley. Long-tailed parakeets seen in the central valley are almost always this species. Watch for the red front and red underwings. Crimson-fronted Parakeets- I see this species on a daily basis. Olive-throated Parakeet: A bird of the northern Caribbean lowlands, it needs more forested habitats than the Crimson-fronted. Plain-looking, long tailed parakeets seen in the Caribbean lowlands are this species. They lack red in the plumage and have wings with darker, contrasting flight feathers than the Crimson-fronted. Orange-fronted Parakeet: This is the common, long-tailed parakeet species of dry forest. They overlap with the Crimson-fronted in the Carara area but can be told by their orange fronts and duller green plumage. Orange-fronted Parakeet from Tambor, Costa Rica. 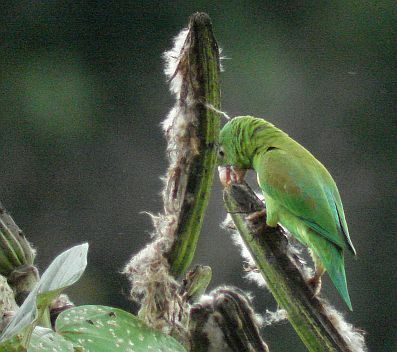 Brown-throated Parakeet: A recent invader from Panama, watch for it in southwestern Costa Rica from the Panamanian border west to Piedras Blancas National Park. 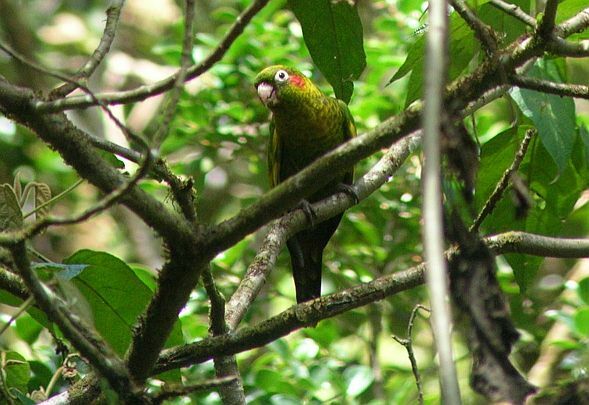 It overlaps with the more common Crimson-fronted Parakeet but lacks the red front and has an orangey-brown throat. Brotogeris genus- one species, common, short-tailed parakeet of deforested lowlands. 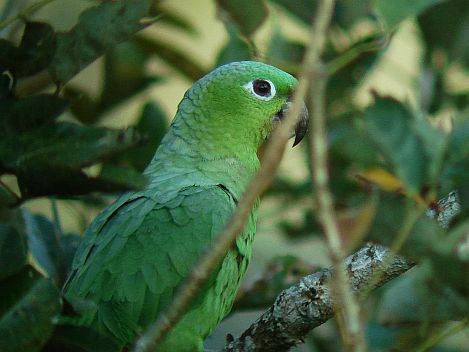 Orange-chinned Parakeet: This common species vies with the Crimson-fronted for holding the title of the most frequently encountered Psittacid in Costa Rica. Any small parakeet with a short pointed tails seen in the lowlands is this species (it also occurs in the Central Valley). Orange-chinned Parakeet, a species hard to miss when birding Costa Rica. Bolborhynchus genus- one species, an uncommon highland parakeet. Barred Parakeet: If you are birding above 2,000 meters in the Central or Talamancan Cordilleras and see small, plain, short-tailed parakeets that remind you of crossbills or other “winter finches”, you have probably seen Barred Parakeets. They could overlap with Red-fronted Parrotlets at certain times of the year but those will show red and yellow in their plumage. Touit genus- one species, a rare, little known bird of middle elevations. Red-fronted Parrotlet: If you see this one when birding Costa Rica, you will have hit the Psittacid jackpot. Not much is known about this species, it is seen very infrequently, and yours truly still needs a better look before counting it as a lifer! It mostly occurs in middle elevation forests and appears to make elevational movements in search of fruiting or seeding trees. Who knows, maybe it was more common in the past before so much of the Central Valley was deforested. I wonder about this because friends of mine saw a small flock for a few days in June in their urban backyard near Heredia! The birds were probably moving around in search of fruiting trees after breeding somewhere up in the Central Cordillera. They have also been recorded high up in the Talamancas as well as in lowland areas. If you see a small, short-tailed parakeet with red and yellow in the wings and lots of red on the head, then you may have gotten the coveted Red-fronted Parrotlet. On a side note, if you do see this species, take as many notes about its behavior, location, etc. as you can so we can get a better handle on its natural history. Timely post, Pat. I just started reading “Spix’s Macaw” by Tony Juniper. Looking forward to finding some of these Psittacids in the near future. You should be seeing quite a few! I would love to find a reliable site for the parrotlets but they might move around too much to do that. Lucky enough to see a pair of Scarlet Macaws flying over the main street of Paquera, near Curu at dusk on March 23 and then two pairs at Curu on March 26 mid morning. @Ann- That’s great! Quite a few birds have been released around there and seem to be doing well. They also seem to be increasing in other parts of the country. Yesterday I saw a pale yellow parrot with a large number of Mealy parrots. I have never heard of a yellow one before. Unfortunately I can not send you the pictures I took right now. They are in my camera. I live in Ventanas, OSA . @Donna- Most likely a Mealy Parrot with a mutation that gives it yellow plumage. Mealy Parrots actually look green because the structure of their feathers reflects the blue wavelength of the light spectrum that then combines with yellow pigmented feathers to give them a green color. In the case of the bird you saw, the structure of its feathers probably don’t reflect blue. Such a mutation can be seen in a number of captive psittacines that are referred to as Lutino varieties. Any chance anyone knows what the huge flock of medium-to-small birds is which occupies the big tree in front of the Sunrise Condos in central Tamarindo? If anyone happens to know, I’m curious. @Niki- Not sure but might they be Scissor-tailed Flycatchers? if you are sure that they are parrots, then they are probably Orange-chinned or Orange-fronted Parakeets. Live above Dominicalito. Last evening there was quite the racket in a tree. Eventually this huge, seemed to be all green in color, sat on a tree top for a serious 20 minutes, quiet, looking around and as it eventually flew away squawking the whole time. It was to far away to see any detail at all. Not sure vent sure it was totally green in color as it was getting dark. But it was big! 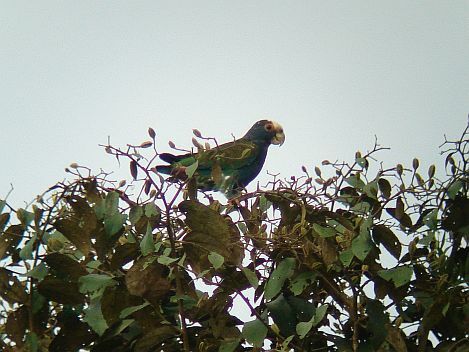 @Jarede- Maybe a Mealy Parrot -they are green, pretty big, and noisy.